I was going through Blogs, and I came across Leslie's page and she had written about another blog that she had read. It was one of the most amazing stories that I think I have ever came across. It was really neat to read about such an amazing family. It really made me appreciate what i have in my life... My son and his health, as well as an awesome husband. The lord has blessed me and my family, and for that I am grateful. I think I need to work on being more appreciative for the trials in my life, and remember to have faith that it's all in god's hands, and that, in the end, it all will work out--- and it all will be OK. 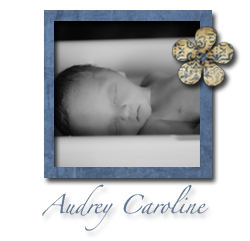 If you would like to read about this story too, click on Audrey Caroline's page under my Pals section or just click here. i bawled my way through that blog. she is one amazing person to be open to share that with people. and an amazing writer too. Wow that was so neat to read, and oh so tender!